The Object of the Game: Eight ball pool is a call shot game with fifteen object balls and a cue ball. One player must pocket all the balls of the group numbered 1 through 7(the solid colours) and the group numbered 9 through 15 (the stripes). The player pocketing their group first and then legally pocketing the 8 ball is the winner of the game. Call Shot: In call shot obvious balls and pockets do not have to be nominated. It is the opponents right to ask which ball and pocket is being selected if they are not sure of the shot. Bank shots and combination shots are not considered obvious and care should be taken in calling both the object ball and the intended pocket. When calling the shot it is never necessary to indicate details such as the number of cushions, banks, kisses caroms and the like. Any ball pocketed on a foul remains pocketed regardless of whether they belong to the shooter or their opponent. Racking the balls: The balls are racked in a triangle at the foot of the table with the 8 ball in the centre of the triangle, the first ball of the rack on the footspot, a solid ball in one corner and a striped ball in the other corner. Alternating Break: Winner of the lag has the option to break. During individual competition, players will alternate breaking on each subsequent game. Jump and Masse Shot Foul: While “cue ball fouls only” is the rule of play when a match is not presided over by a referee, a player should be aware that it will be considered a cue ball foul if during an attempt to jump, curve or masse the cue ball over or around an impeding numbered ball that is not a legal object ball, the impeding ball moves (regardless of whether it was moved by a hand, cue stick follow-through or a bridge). Object Balls jumped off the Table on the Break: If a player jumps an object ball off the table on the break shot it is a foul and the incoming player has the option of accepting the table in position and shooting, or taking cue ball in hand behind the head string and shooting. 8-Ball Pocketed on the Break. If the 8-ball is pocketed on the break the breaker may ask for a re-rack or have the 8-ball spotted and continue shooting. If the breaker scratches while pocketing the 8-ball on the break the incoming player has the option of a re-rack or having the 8-ball spotted and begin shooting with ball in hand behind the headstring. Open Table: (Defined) The table is “open” when the choice of groups (stripes or solids) has not yet been determined. When the table is open it is legal to hit a solid first to make a stripe or vice-versa. 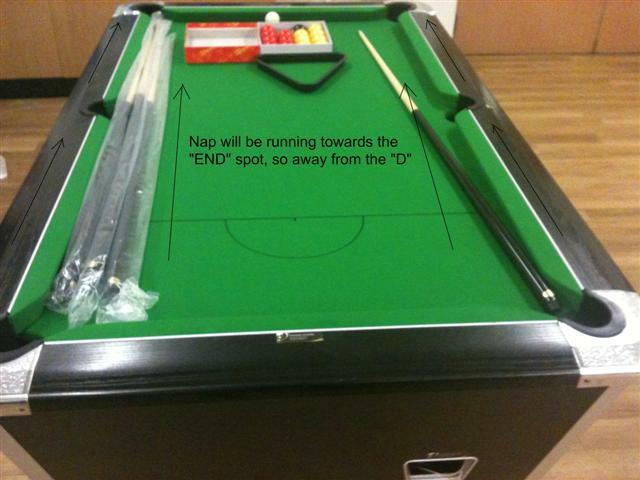 *note: The table is always open immediately after the break shot. 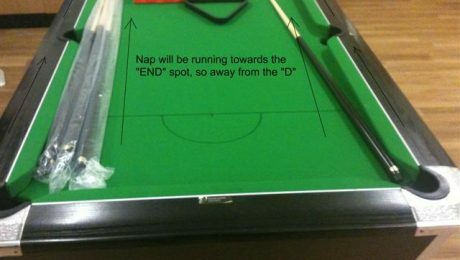 When the table is open it is legal to hit any solid or stripe or the 8-ball first in the process of pocketing the called stripe or solid. However, when the table is open and the 8-ball is the first ball contacted, no stripe or solid may be scored in favor of the shooter. The shooter loses their turn – any balls pocketed remain pocketed and the incoming player addresses the balls with the table still open. On an open table all illegally pocketed balls remain pocketed. Choice of Group: The choice of stripes or solids is not determined on the break even if balls are made from only one or both groups. The choice of group is determined only when a player legally pockets a called object ball after the break shot. Legal Shot: (Defined) On all shots (except on the break and when the table is open), the shooter must hit one of their group of balls first and pocket a numbered ball, or cause the cue ball or any numbered ball to contact a rail. “Safety” Shot: For tactical reasons a player may choose to pocket an obvious object ball and also discontinue their turn at the table by declaring a “safety” in advance. A safety shot is defined as a legal shot. If the shooting player intends to play safe by pocketing an obvious object ball then prior to the shot they must declare a “safety” to their opponent. If this is NOT done and one of the shooter’s object balls is pocketed the shooter will be required to shoot again. Any ball pocketed on a safety shot remains pocketed. Scoring: A player is entitled to continue shooting until they fail to legally pocket a ball of their group. After a player has legally pocketed all of their group of balls they shoot to pocket the 8-ball. Combination Shots: Combination shots are allowed; however, the 8-ball cannot be used as a first ball in the combination except when the table is open. Illegally Pocketed Balls: An object ball is considered to be illegally pocketed when that object ball is pocketed on the same shot a foul is committed, or the called ball did not go in the designated pocket, or a safety is called prior to the shot. Object Balls jumped off the Table: If any object ball is jumped off the table it is a foul and loss of turn unless it is the 8-ball which is a loss of game. Any jumped object balls are spotted in numerical order according to General Rules for spotting balls. Playing the 8-Ball: When shooting at the 8-ball a scratch or foul is not loss of game if the 8-ball is not pocketed or jumped from the table. Incoming player has cue ball in hand. Note: A combination shot can never be used to legally pocket the 8-ball. – Fouls when pocketing the 8-ball (exception: see 8-Ball Pocketed On The Break). – Pockets the 8-ball on the same stroke as the last of his group of balls. – Jumps the 8-ball off the table at any time. – Pockets the 8-ball in a pocket other than the one designated. – Pockets the 8-ball when it is not the legal object ball. Stalemated Game: If after 3 consecutive turns at the table by each player (6 turns total) the referee judges (or if both players agree when no referee is present) the balls will be reracked with the original breaker of the stalemated game breaking again. The stalemate rule may only be used when there are only two object balls and the 8-ball remaining on the table.